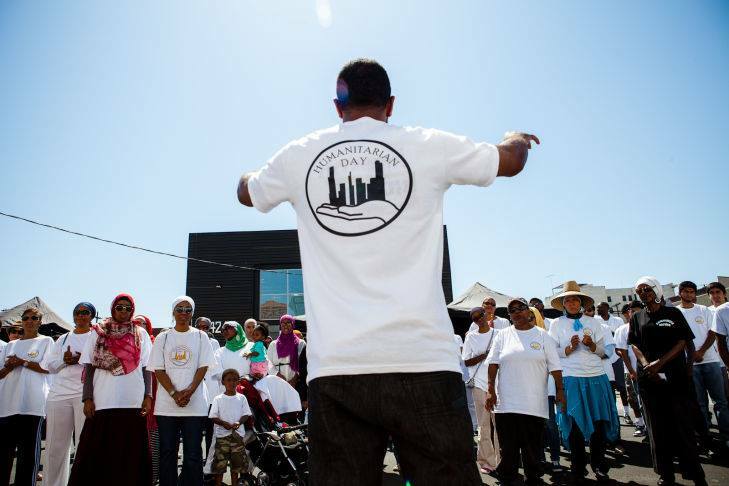 On Sunday July 3, 2016 the 17th Humanitarian Day (HDAY) was held in Downtown Los Angeles’ Skid Row Community. The theme was “Save a Life, Save Humanity” hopefully to make it an anthem throughout the year. Volunteers, Organizations, and Institutions for the last 17 years facilitated by ILM Foundation, continue its effort to express a “social responsibility” for Southern California’s homeless citizens. We convert charity into direct services and advocacy for homelessness; hoping to provide some relief to LA County’s 12%. HDAY is a reflective action of Neighborly Needs, or Small Kindnesses; a demonstration of faith as spoken in Holy Qu’ran (107.) Muslims and interfaith communities find themselves sharing this common value, from within their own Holy texts. The HDAY Community has made it a tradition, to exemplify Compassion that embodies dignity, love, and respect for others; during the month of Ramadan. HDAY provides medical screenings, dental care, and eye examinations with hygiene kits, fresh meals, and new clothing for Southern California homeless; not only in LOs Angeles but in Riverside, Pasadena, Santa Ana, Oakland, and Long Beach communities. We are thankful to Fox News Los Angeles, for covering this event; with a type of journalism that reflect American values, showing the world that we can exhibit compassion in the United States. We are thankful for the HDAY Staff, the network Coalition Preserve Human Dignity (CPHD), and the people whom we serve for supporting HDAY over the years.